Nice, beautiful and very detailed offline maps. Always find the right way and even it is just a small path, thanks to a high resolution map and contour lines. Switchable POIs keep the view clear on essentials. You can search for all POIs, as well as for a variety of streets, towns, villages and districts. A displayable overview map shows in a reduced scale which part of the island the map section is located in. A location function displays the current position. Yes, the app uses an integrated map, so no online connection is required. How accurate is the current location? The accuracy of the current location depends on the quality of the smartphone or tablet, as well as the quality of the satellite signals, for example: Clouds and trees can affect the signal. The accuracy can be improved by switching on WiFi and by using a mobile device with a telephone function. How can I help to improve the content? The contents of this app are extracted from OpenstreetMap and are no longer edited. 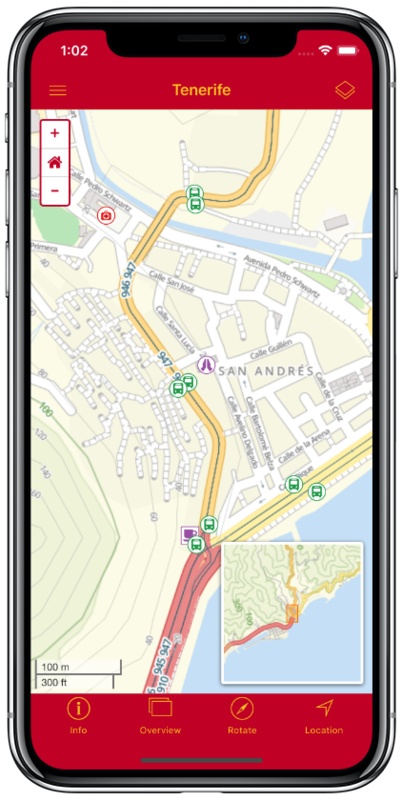 If you would like to see more information in the app or correct errors, you can do this with OpenStreetMap. The information will then appear in a future version of the app. These apps do not collect personal or location related data and are working offline.